How much power do our words really carry? Is it possible that our words-the air that we invite into the deepest recesses of our body and then carefully expel through the sacred organ of our vocal chords-have a power that is so great that it was intentionally confused over 5,000 thousand years ago? What would it mean to re-discover the secret of the language that heals our deepest hurts, breathes life into our greatest joys, and literally creates Reality itself? The result of over thirty years of research and the experiences of many thousands of people, Conscious LanguageTM - The Logos of NOW is the premier guide to conscious language in the 21st Century. 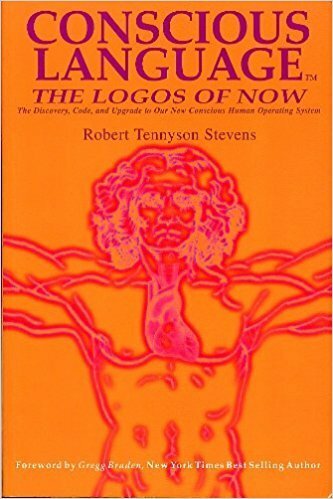 Through 17 concise chapters, the pioneering work of Robert Tennyson Stevens masterfully leads us on a step-by-step journey in the new science of Conscious Languaging; the science of choosing the words that express our true intent, and knowing that our words are the quantum templates of health, abundance, peace and relationships! - Excerpt of foreword by Gregg Braden, New York Times Best selling author of: The Divine Matrix, The God Code, Secrets of the Lost Mode of Prayer, and The Isaiah Effect. Our outcome in Mastery Systems is to give tools and techniques for individuals to know their own highest choices in any situation, to express their choices with ease and clarity, and to have full-body alignment (head and heart) in their choices. Mastery of ourselves begins with using Conscious LanguageTM. Imagine installing on your inner "heart drive" a new Conscious Human Operating System which keeps you aware and awake to self-sabotage before it can act. Imagine a human computer virus checker which finds all those pesky viruses and limiting beliefs, lies, doubts and agreements with limitation and offers each limitation to your awareness for upgrading. The virus is called the Babel Virus. The upgrade is called Pure Speech (Conscious LanguageTM). If you have any questions about this product by Mastery Systems Corp, contact us by completing and submitting the form below. If you are looking for a specif part number, please include it with your message.